The Ahmadiyya Muslim Community is a dynamic, fast growing international revival movement within Islam. Founded in 1889, it spans over 200 countries with membership exceeding tens of millions. Its current headquarters are in the United Kingdom. 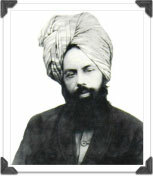 In 1914, Hazrat Mirza Bashir-ud-Din Mahmood Ahmad (ra) was elected the second successor to the Promised Messiah (as). He felt that a vigorous participation of Ahmadi women was as essential for the success of the Community as that of men, and started activating them for this purpose. In pursuance of this objective in 1922, he wrote a letter to some prominent ladies in the Community, detailing therein the role which Ahmadi women should play to make Islam go ahead. He called upon them to disseminate his views among their sisters, win their sympathies for his plans and to form an Association to help the resurgence of Islam. This led to the establishment of Lajna Ima'illah (maid servants of Allah).